This grand Georgian house was built in the mid-1740s by the Needham family, Earls of Kilmorey in Ireland. Just north east of the church, it occupies an important site in the village which can be traced back to the 1500s. 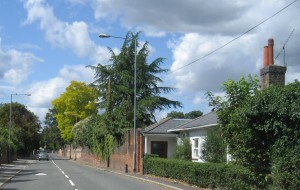 Its long garden wall bordering London Road is a significant visual feature of the village and is dated to 1748. The cottage at the far end of the wall, by the Cricket Club’s entrance, also has a history as the gardener’s cottage for the main house. The name ‘Datchet House’ was in use by the mid-1800s and may be older than that. It implies that its owners considered their house to be the most significant in the village, but it has never been owned by the lords of the manor. Datchet House was originally of three stories, as a Georgian house on this scale should be, but the top floor was removed and the roof lowered by the film star Laura la Plante who lived there between 1932-1935. Nobody knows why this was done but it is well remembered by those who were here at the time. The house had already been considerably rebuilt and extended in the 1880s, when extensive carved panelling was inserted into the hall and main rooms. Its imposing 18th century doorway has an extremely fine traceried fanlight, but it could be of a later date or not original to this house. The Needhams continued to own the house through the 1800s, when it was occupied by the family’s aged spinsters and widows, including Lady Georgiana who gave the drinking fountain to the village. In the early 20th century it was the home of Sir Lionel Cust, Surveyor of the King’s Pictures and designer of the village’s war memorial in 1920. 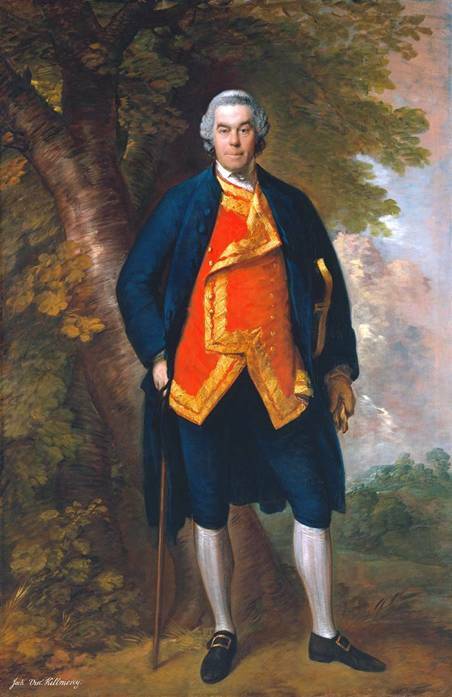 (He was also a distant relation of the Needham family.) During WWII Datchet House served as a base for the Home Guard. An art historian of considerable repute and the Director of the National Portrait gallery, Sir Lionel was also said to have had a ‘gift for simple pleasures’, and he certainly entered into the life of the village in many ways. 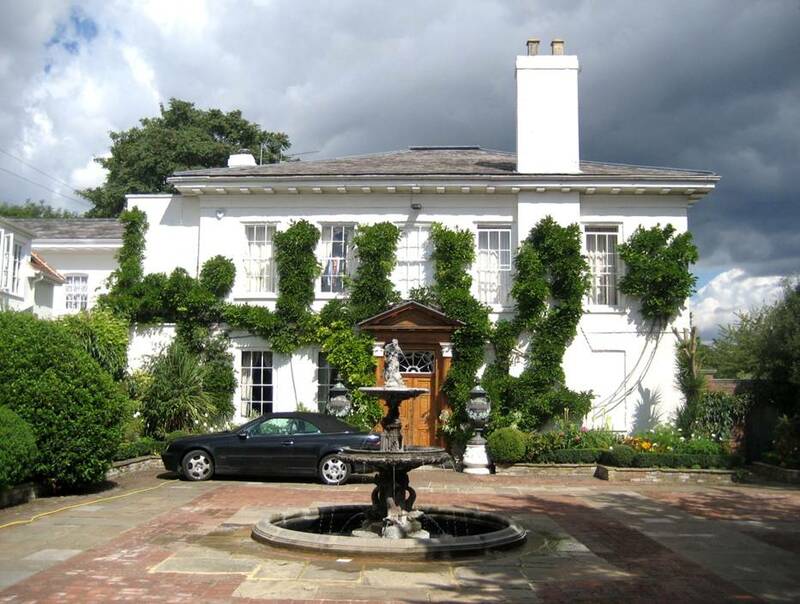 There is a Cust family connection to the Needhams, so it is possible that he knew the house before moving here from Windsor, buying it in 1911. 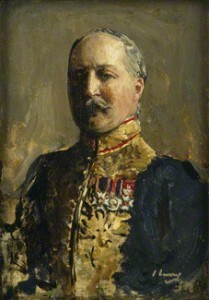 He was one of King Edward VII’s Gentleman Ushers at Court and also a personal friend, with responsibility for collections in all the royal palaces. After Sir Lionels’s death Lady Cust sold the house and its contents in 1932. 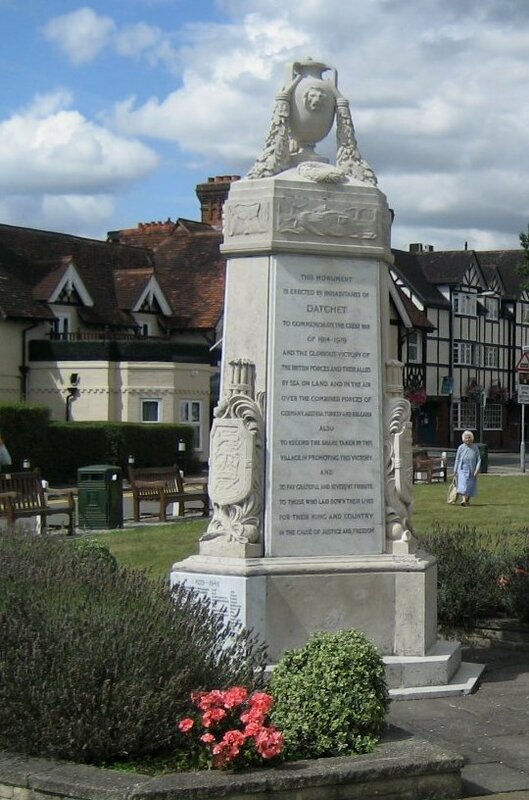 The village’s war memorial was designed by Sir Lionel and is an unusually fine monument with its high quality sculptured panels depicting war on land, sea and in the air. He also took a great interest in the lives of ordinary people, acting as chairman of the Datchet Co-Partnership Housing & Allotment Society which provided some of the first ‘social’ housing in the country in Ditton Road. 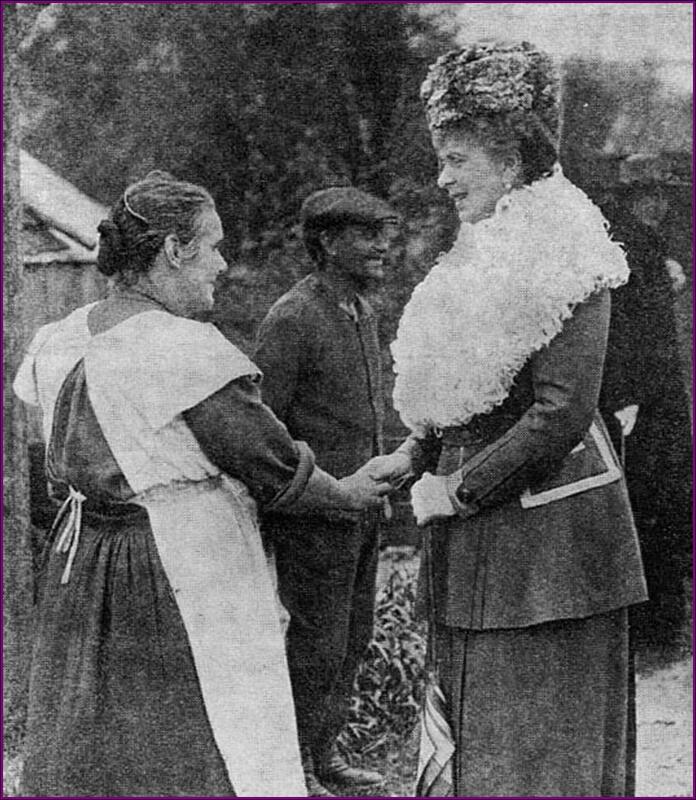 He brought King George V and Queen Mary to visit the first residents at the cottages in 1919. Although their chief property was in Ireland, the Needhams owned an estate in Shropshire and occupied a house in Iver before arriving in Datchet. 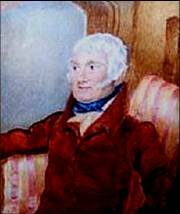 It was principally Anne, the wife of John Needham the 10th Viscount who lived in Datchet, having moved here from Iver. A tantalising note was left by a previous historian of the village, saying that Datchet House was conveyed to the Needham family in 1747. Since he gave the precise date of the deed he must have seen it, but recorded no further information. The long wall is dated to 1748 because Lady Anne Kilmorey acquired a strip of land ‘on which to erect a wall’ from land belonging to the Lord of the Manor in that year, and it is very likely that the house was rebuilt at that time. John and Anne’s son General Francis Needham, created First Earl Kilmorey in 1822, was Aide-de-Camp to George III in the 1790s and fought in the American War of Independence. He and his wife, also Anne, had two sons and seven daughters and it was several of these Needham daughters, as spinsters and widows, who continued to live in Datchet House with a full battery of servants and at the very pinnacle of Datchet society. 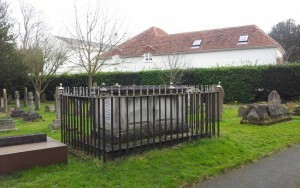 Twelve of the family are buried in the churchyard, east of the church and within view of the House, although earlier generations are commemorated in the chancel of the church. The last representative, Lady Jane Selina Hinde died in 1910 aged 93, not an unusual age for this family; the youngest of the Earl’s daughters, Lady Mabella Josephine Knox, lived from 1801 to 1899. 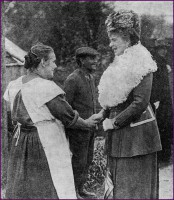 It was Lady Georgiana who is best remembered in the village for her gift of the drinking fountain and for an extension to the Working Mens’ Club as a village hall. She died in 1888 aged 93. The house can be followed back before the Needhams’ time, but only through rather difficult purchase or mortgage deeds and parish or manor surveys. Very little is known about any of these occupiers or the building itself, but the ownership history has been reliably established back to 1524. In the 1622 survey of the Manor of Datchet the house was described as a mansion with barn, stables, orchard and garden, and an acre of land attached, but it is presumed that nothing survives from this time. The first actual reference to a house on this site is in a 1607 description of the vicarage which refers to William Phillips’ house as being on the east of the vicarage, which can only be Datchet House. Phillips had married the wealthy Margaret Pitt in 1586 and he died in 1618. His son must have inherited the house as another William Phillips is recorded there in 1622. The death of this William Phillips in 1653 fits with George Vaux’ ownership, though there is no record of a sale to him. George Vaux died in 1662 and the house was inherited by his eldest son John. Through sale deeds and mortgages its ownership, but no other information, can be traced through to the 1720s just before it was acquired by the Needhams.